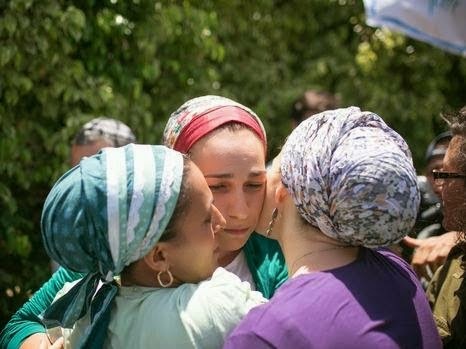 The three mothers of the kidnapped teenagers comforting each other. Living in Israel is just waiting for for an argument to erupt. Not only are the Israelis VERY vocal in sharing their opinions, they also never seem to agree about anything. An innocent question to a person at a bus stop about whether the bus will drop me at the train station suddenly involves a five-person crowd, all with conflicting advice. They all gave me their unasked and non usefull opinions and they also argued between themselves. I have seen family members yell each other about which olive oil is the best to use. Israelis argue about parking spots, the queue order at doctors' offices and whether or not they are allowed to swim with regular clothes in a swimming pool (they are not, only proper swimming clothes are allowed ). And I have not even started to mention politics. There are a lot of political parties in this small country, all with a very different view of how things should be done. The saying of "two Jews and three different opinions" is really true. It is actually amazing that anything gets done in the country because hardly anybody agrees with anybody else! In times of war, bombings, terror attacks and kidnappings, Israelis stand together in the most amazing way. Basically the entire country walked a few kilometers from north to south in the country in support for the kidnapped soldier Gilad Shalit. When the city of Ashkelon in the south was attacked by missiles from Gaza, people from the center and north hosted families who they have never met. Pizza delivery men decided to work so that people who were sitting in their bomb shelters could treat their children to a pizza. A mobile phone company handed out free cellphones to the survivors of an exploded bus to that they could phone their loved and tell them that they are okay. On every Remembrance day, held just before Independence day, every single fallen soldier and every person killed in a terror attack is remembered and cried over again. And now once again, the entire country are thinking of, praying and comforting the three families whose teenage sons have been kidnapped. All the small differences that can lead to such heated arguments are now put aside and everyone is doing their tiny bit to support these families. Nearly 30, 000 Israeli Jews gathered at the Western Wall in Jerusalem to pray for the save return of the kidnapped boys. Many Jewish women and girls lit candles at the start of yesterday's Shabbat and also prayed for the boys' return. The saying "Laugh and the whole world laughs with you, but cry and you cry alone." is so not true in Israel. If just one Israeli is hurt, kidnapped or killed, everyone is crying. The sense of community and unity in these bad times is amazing and hard to describe to anyone who is not experiencing it. But you know what, I prefer the argumentative Israelis any day. It is so much better to hear that you are an idiot because you do not have eyebrows done at the best cosmetician in town than being asked by a stranger if there are any news and to know exactly what she is talking about. It is so much better to have a parking spot stolen than seeing the sadness in your eyes reflected in the eyes of those around. It is so much better to live in an irritated and argumentative Israel than in a sad and unified Israel. Please pray for the safe return of Eyal, Gilad, and Naftali. Update: The bodies of the three teenagers were found three weeks later, buried in shallow graves. They were murdered not far from where they were kidnapped.